Crispy, crunchy and delicious cinnamon apple chips are the perfect grab and go snack. We love taking our family and friends to Jordan Pond House in Acadia National Park. They serve the best apple chips that I have ever eaten. I tried recreating them and I think they turned out delicious! My grandkids loved them too! I decided not to core the apples and used the mandolin to slice them very thin. I used two very large Gala apples. Sprinkle with cinnamon sugar and bake on a low temperature in the oven. Have you ever used a mandoline? This was my first time using a Box Mandoline and love how easy it is to use. There are hundreds of recipes that I can’t way to try using my Box Mandoline and Grater. I love my Box Mandoline and Grater so much that I am giving away one Box Mandoline and Grater to ONE LUCKY WINNER! 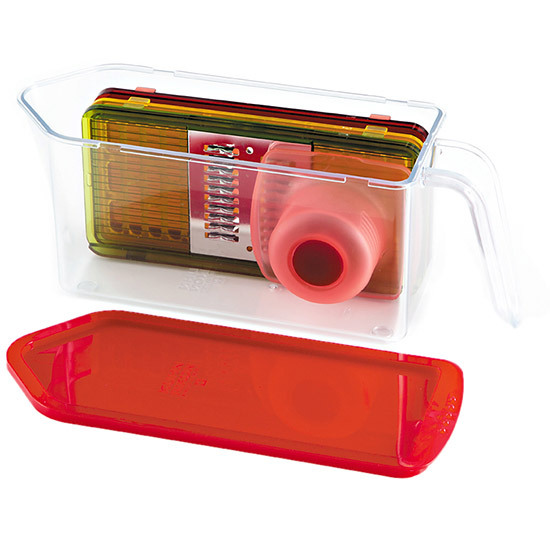 Julienne, slice, and grate like a professional with one compact kitchen tool! Blades easily snap on to the top of the storage container allowing for neat and easy use. Use a push-pull method on the julienne double-edged stainless steel blade attachment to get perfect thin strips every time. The V-blade attachment slices potatoes, zucchini, cucumber, carrots, lemons, apples, and more with its extra sharp stainless steel blade. Use the grater attachment to quickly and easily grate cheese for pasta, garlic, and ginger for a stir fry, or citrus for desserts. The nonslip base and easy-grip handle provide safety and stability while cutting. Comes with a hand guard to protect your fingers while slicing. When you’re done, simply snap on the storage lid to store leftovers, or to store the 3 blades and hand guard. Non-slip base and an easy-grip handle for safety and stability while cutting. Use the push-pull method for quick cutting and grating. Pour spout for neat draining. Warning: Not for children – blades are very sharp. Improper use may result in injury. Not for use in the microwave or freezer. 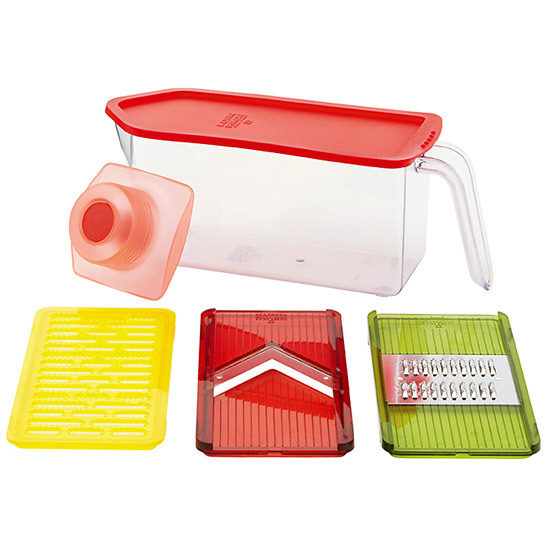 Storage container, lid, and grater attachment are dishwasher safe. Hand wash and air dry for Julienne and V-Blades. Just leave a comment below telling me what recipe you will make first if you win a Box Mandoline and Grater? Crispy, crunchy and delicious cinnamon apple chips are the perfect grab and go snack. In a small bowl, stir cinnamon and sugar together. Set aside. Slice apples with the mandoline slicer. Line two sheet pans with parchment paper, and place the apple slices side by side on parchment paper, in a single layer. Don't overlap the apple slices or place them on top of each other, they won’t crisp up. Sprinkle the apple slices with the cinnamon sugar. Bake the apple slices for 1 hour, then remove them from the oven and flip them over. Return the apple slices to the oven for another hour, then turn the oven off. Let the apple chips cool completely in the oven, this is when they will crisp up. Giveaway Ends September 12, 2016 at 12:00 a.m. Giveaway is over, Melissa S is the winner. 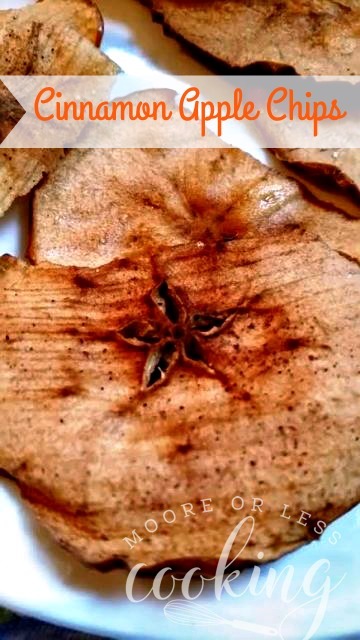 I love Apple Chips, I will make the Apple Cinnamon Chips first. Thank you for the recipe! If I win a Box Mandoline and Grater I would love to make scallop potatoes! 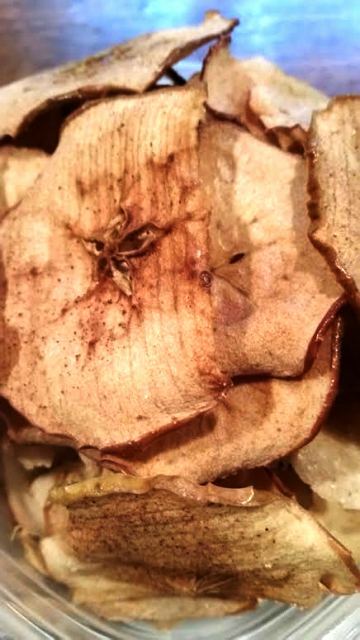 I’d make these cinnamon apple chips. I would make Sugar free apple butter if I won this fantastic Mandoline and grater. I have quite a few diabetic friends and neighbors, sugar free fruit butters are rare in stores. If I win a Box Mandoline Grater I will make hash browns which my family loves since we love to have breakfast for dinner,but the one thing I didn’t like doing was grating the potatoes,this product is so much easier and I want to make them now! I would love a Box Mandoline like this! All of the different Blades are great, and I love how everything stores together! I would make Zoodles…slicing the Zucchini really thin. My husband loves Cole Slaw and this would make slicing so much easier! Thanks for this chance 🙂 Love your Cinnamon Apple Chips recipe! These apples look delicious… I would make these any my scalloped potatoes. Thank-you for the chance to win. 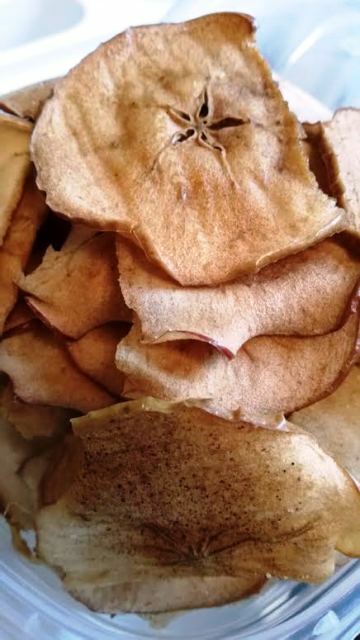 I am thinking these apple chips would be so great to make if I won! I love these! I’ve really been wanting a mandolin slicer to cut the carrots and cucumbers for making California Roll sushi. I have a number of other recipes that call for thinly sliced or julienned vegetables. I don’t know the name of it, but I did make one dish that required julienned carrots and golden bet, and chopped red cabbage and kale, and stir-fried together with cooked quinoa,onion, and seasonings. Topped with over-easy egg and I used pumpkin seeds as topping. I’ll have to dig out that recipe if I’m lucky enough to win this. I would use it to make the apple chips. I grate a lot of cheese around here, so that’s probably what it will be used for…. most likely tacos, chalupas or enchiladas ! Thanks so much for giving us a shot at this great giveaway! I think I would like to try your recipe above for Cinnamon Apple Chips. If I won, I would grate some carrots with it and make a carrot cake. I’ll make apple chips when apple picking starts but thinly sliced onions from my garden will be carmalized and turned into onion jam. Sweet potato chips. We make/eat them several times a week, and trying to achieve consistent and thin slices with my knife is sooo tedious. I love cold slaw, fish and chips, and all kinds of salads. I’d use it to make a cucumber and tomato salad. I would make coleslaw using my mother-in-law’s wonderful recipe. My Grand Daughter loves apples, and cinnamon, so I would use it for the apples chips first. I would like to try it with cucumbers, and tomatoes, with some onion, and feta cheese, maybe with some baby spinach added, and a vingarette on top! sounds yummy!! I would like to make some potato chips. They would be so good. I have been wanting a mandoline slicer for a long time, I would use it for my stir fries and slice my onions thin, mushrooms and lots of other veggies. First thing I will do is grate up a ton of cheese for quesadillas, nachos, burritos, etc. I would love to make apple chips, but also I would love to make parsnip chips with this! Those little mandolin sets are very cool and I’d love to win one. I’d make scalloped potatoes. With apple season around the corner I would make the Apple chips. Also would like to do zucchine chips. Love apple chips – and love how everything stored together with the mandolin! I love apples! They look very good, but I think I’d use a different variety. I would love to have this to slice sweet potatoes for chips or white potatoes for scalloped potatoes. Slicing freehand is tedious and inconsistent. I’d like to try using this on persimmons (the firm kind) befire drying them. I would use the mandolin to make sweet potato chips coated with cinnamon, a bit of cayenne pepper, salt and rosemary. I would use it to make apple slices. I will be getting a bushel Sept 16 and I am going to make freeze dried apples! This would be so awesome to slice them! It will be my first time making them so this would really be handy for slicing them all evenly. Of course the apple chips would be first (I have two trees full right now), but then I’d have to make zucchini fritters.